Characteristics of glioma stem cells (Review article). Twist2 functions as a tumor suppressor in murine osteosarcoma cells. Establishment of HRAS(G12V) transgenic medaka as a stable tumor model for in vivo screening of anticancer drugs. Matsuzaki Y, Hosokai H, Mizuguchi Y, Fukamachi S, Shimizu A, Saya H.
PLoS One. 2013;8(1):e54424. doi: 10.1371/journal.pone.0054424. Epub 2013 Jan 14. IGF1 Receptor Signaling Regulates Adaptive Radioprotection in Glioma Stem Cells. Osuka S, Sampetrean O, Shimizu T, Saga I, Onishi N, Sugihara E, Okubo J, Fujita S, Takano S, Matsumura A, Saya H.
Stem Cells. 2012 Apr;31(4):627-40. doi: 10.1002/stem.1328. Redox regulation in stem-like cancer cells by CD44 variant isoforms (Review article). Cancer Res. 2013 Mar 15;73(6):1855-66. doi: 10.1158/0008-5472.CAN-12-3609-T. Epub 2013 Jan 14. Lysyl oxidase is induced by cell density-mediated cell cycle suppression via RB-E2F1-HIF-1α axis. Goto TM, Arima Y, Nagano O, Saya H.
Cell Struct Funct. 2013 Jan 19;38(1):9-14. Epub 2012 Nov 30. Complexity of cancer stem cells (Review Article). Int J Cancer. 2013 Mar 15;132(6):1249-59. doi: 10.1002/ijc.27961. Epub 2012 Dec 17. Review. The APC/C activator Cdh1 regulates the G2/M transition during differentiation of placental trophoblast stem cells. Naoe H, Chiyoda T, Ishizawa J, Masuda K, Saya H, Kuninaka S.
Biochem Biophys Res Commun. 2013 Jan 11;430(2):757-62. doi: 10.1016/j.bbrc.2012.11.075. Epub 2012 Dec 1. APC(CDH1) Targets MgcRacGAP for Destruction in the Late M Phase. Nishimura K, Oki T, Kitaura J, Kuninaka S, Saya H, Sakaue-Sawano A, Miyawaki A, Kitamura T.
PLoS One. 2013 May 16;8(5):e63001. doi: 10.1371/journal.pone.0063001. Print 2013.
cAMP/PKA signalling reinforces the LATS-YAP pathway to fully suppress YAP in response to actin cytoskeletal changes. Kim M, Kim M, Lee S, Kuninaka S, Saya H, Lee H, Lee S, Lim DS. The Arf/p53 Protein Module, Which Induces Apoptosis, Down-regulates Histone H2AX to Allow Normal Cells to Survive in the Presence of Anti-cancer Drugs. Atsumi Y, Inase A, Osawa T, Sugihara E, Sakasai R, Fujimori H, Teraoka H, Saya H, Kanno M, Tashiro F, Nakagama H, Masutani M, Yoshioka K.
J Biol Chem. 2013 May 10;288(19):13269-77. doi: 10.1074/jbc.M112.402560. Epub 2013 Mar 27. Ink4a/Arf(-/-) and HRAS(G12V) transform mouse mammary cells into triple-negative breast cancer containing tumorigenic CD49f(-) quiescent cells. Arf and p53 act as guardians of a quiescent cellular state by protecting against immortalization of cells with stable genomes. Osawa T, Atsumi Y, Sugihara E, Saya H, Kanno M, Tashiro F, Masutani M, Yoshioka K.
Biochem Biophys Res Commun. 2013 Mar 1;432(1):34-9. doi: 10.1016/j.bbrc.2013.01.091. Epub 2013 Jan 31. Kobayashi Y, Banno K, Shimizu T, Ueki A, Tsuji K, Masuda K, Kisu I, Nomura H, Tominaga E, Nagano O, Saya H, Aoki D.
Placenta. 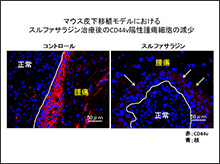 2013 Feb;34(2):110-8. doi: 10.1016/j.placenta.2012.11.003. Epub 2012 Nov 28.